Have you ever heard the saying, “Eat the rainbow?” If you have, great! If you haven’t, this saying is just implying that when eating fruits and vegetables, it’s important to include a wide variety of different colors. While this phrase is catchy and fun, it has tons of scientific reasoning behind it. 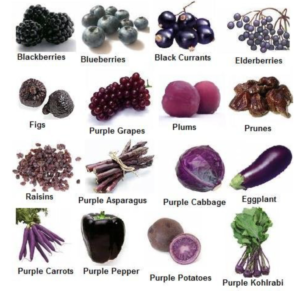 From red to purple, every color implies something beneficial about the nutrients. With Independence Day around the corner, I thought I’d focus on certain phytochemicals included in red, white, and blue colored fruits and vegetables. Fruits and vegetables have multiple types of phytochemicals. Phyto means “plant,” so phytochemical just indicates plant chemicals. Phytochemicals are not considered nutrients, because a nutrient is a substance needed to sustain life. However, research has shown that a diet rich in phytochemicals may function to protect health as antioxidants, phytoestrogens, and anti-inflammatory agents. Multiple phytochemicals contain pigments that give them their distinct colors. With this information, you can now apply the catch phrase, “Eat the rainbow,” and know that it implies that each color indicates a different type of phytochemical and benefit! Red fruits and vegetables are packed with the multiple antioxidants, but I want to focus of the predominant pigment, lycopene. Lycopene is a compound responsible for the red color of tomatoes and watermelon. High intake of this powerful antioxidant has been associated with decrease risk of prostate and digestive tract cancers. Who wouldn’t want that? 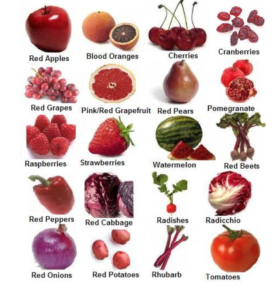 A few examples of red fruit and veggies include tomatoes, red potatoes, watermelon, strawberries, blood oranges, and beets. Next color on the flag… White! White is a funny one huh? I don’t know about you, but I wouldn’t have thought the color white could have benefits. Oh boy was I mistaken. The name for the plant pigment in white fruits and vegetables is called anthoxanthin. Some anthoxanthin-containing foods contain another antioxidant called allicin, such as in garlic and onions. Anthoxanthin and allicin may help lower cholesterol and blood pressure, and may reduce the risk of certain cancers and heart disease. So hey, don’t skip white! It’s an important color too!! 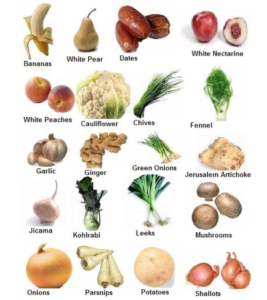 White colored foods include cauliflower, bananas, apples, onions, garlic, pears, mushrooms, any many more. Last but not least, we have blue! Most of the red, purple, and blue colors seen in fruits and vegetables are due to the pigment anthocyanin. I know, it looks similar to anthoxanthin… don’t get them confused. Anthocyanin is an antioxidant that may lower the risk for cardiovascular disease and preserve brain function as we age. I don’t know about you, but I could definitely use the extra help to preserve my brain. Top sources of anthocyanin containing foods include sweet cherries, blueberries, raspberries, red onions, pomegranates, strawberries, and cranberries. 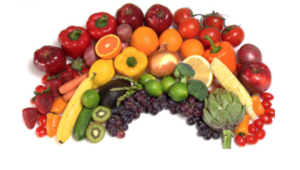 Well, we’ve learned that the saying “Eat the rainbow” is a fun and easy way to remember to include a wide variety of colors when choosing fruits and vegetables. Each color implies something beneficial such as preserving brain function, heart health, or even protection against certain cancers. This July, let us make a goal to slowly incorporate many different colors of fruits and vegetables. It’ll be awesome! Can’t think how? Look up multiple recipes and try them out! With this goal, together we can take a step towards living happier and healthier lives.